Ria Formosa is a natural paradise between the land and the sea.Consisting of a line of sand dunes, barrier islands and sandy peninsulas, all stretching parallel to the coast, the Ria Formosa Natural Park is a unique lagoon system in a state of permanent change, due to the continuous movement of winds, currents and tides. A gift from nature spreading over an area of roughly 18 thousand hectares, making the transition between the land and the sea along a 60-kilometre stretch of the Algarve coastline. Endowed with some exceptional natural and geographical characteristics, this wetland area enjoys a fully justified international reputation as a valuable and privileged habitat for all kinds of fauna and flora. Amongst the vegetation, attention is drawn to the typical marshland plants, adapted here to the excessive salinity of the salt marshes. 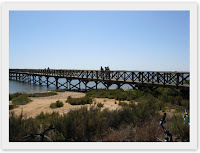 The animal kingdom is represented by many different species that have made their home in the Ria Formosa Natural Park, which is also an important stopping-off point for many migratory birds. Flamingos, buzzards, woodcocks and kingfishers are the most common species of birds, but the park’s symbol is the purple gallinule, a rare species that is to be found in Portugal, breeding only in the lakes of this area. Whenever we are in the Algarve we feel the need to come here, we always feel close to nature when we cross the bridge over the "ria" to the ocean! The photo was taken from the eco path by the golf course right at the entrance of the bridge that takes us to the Atlantic!